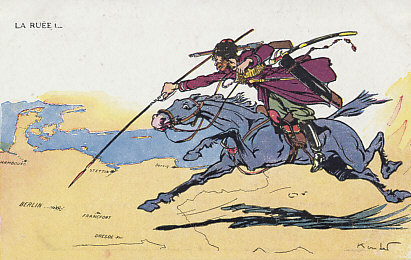 A Russian Cossack and his mount jump the border into Germany, his lance aimed squarely at Berlin. This French fantasy of its Russian ally sharply contrasted with the slow advance into East Prussia of the Russian First Army and the disastrous offensive of the Russian Second Army that ended in its destruction at Tannenberg. Germany then turned back to the Russian First Army in the First Battle of the Masurian Lakes, and drove it from Russia. Illustration by Kunder (? ).